That's how many weeks along I am as of today. And boy, am I feeling it or what? Got a new haircut this weekend. Feelin' good about that. More than anything, I just want to be done. Done, done, done. I feel like a pan of brownies in the oven (yum) that look done by all appearances, but are still a little mushy in the middle. You can tell because if you insert a toothpick into my belly, it doesn't come out clean. Har, har. Brownies. Mmm. Did I mention I made some homemade brownies last week and they were deeeelicious? Corn syrup is the secret to chewy goodness. And lots of vegetable oil. I also made two dozen oatmeal raisin cookies yesterday afternoon and they were so good, I ate six this morning. I sure hope the scale forgives me. Anyway, I'm at that awkward pregnancy stage when nothing fits, I'm feeling pretty miserable and I look like I'm about to pop, yet I still have FIVE WEEKS left. So I'm nowhere close to actually being done. But everyone thinks I should be. And I think I should be. I'm pretty sure God designed it this way. That by the end, we'd be so sick of pregnancy we wouldn't be afraid to push the baby out. It's genius, really. And that's what's going on with me. I do have a baby shower coming up this weekend, hosted by my lovely sister-in-law, and I'm sure it'll buoy me up a little. Nothing like gifts, good company and food. Ohhhhh yeeeeeah. Another thing: I need to come up with a nickname for my baby. Obviously, Bubby is not my daughter's real name. But I'm thinking I'll follow suit with the next kid and call him something funny to preserve his identity. I'm leaning toward Smush. Thoughts? You are looking great! Hang in there a few weeks. I do like Smush, it's too cute. My first was also Bubby. My next one is my little budda (like buddy but ends in an 'a') It fits him because he is a little chunk of butter! You still look so good! 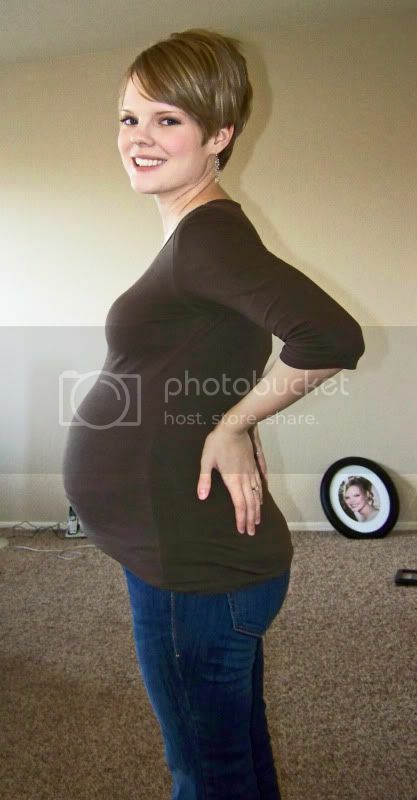 Totally cute pregnant lady. And you are right, it must be designed that way on purpose. We have the same due date! I have been following your blog via a link from Baby Center... it's a race to the finish! Ha ha. I completely understand. I hate being pregnant. It's ALMOST over, but not quite. I keep praying this baby will be early but not too early, know what I mean? Anyway, good luck with the nickname.